All the photos in this post have been taken using my mobile phone, some of them using Instagram, so the quality/colour isn't great. But they are the only photos I've go,t so I will use them. Over recent weeks I have been spinning. Oh, it is wonderfully soothing to the mind when you tease out the strands from such lovely stuff as fluff. I've quickly become addicted. 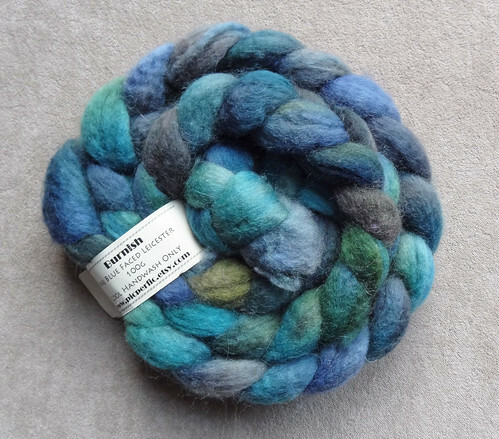 I've spun some Blue Faced Leicester fibre that was undyed and I finished making that up. I bought a couple of bobbins after putting my first section of plies on a loo roll, and while that worked, it felt like it would collapse on itself really easily. I made my own lazy kate, after a tip from the YarnGasm videocast (this episode, towards the end). It worked really well. 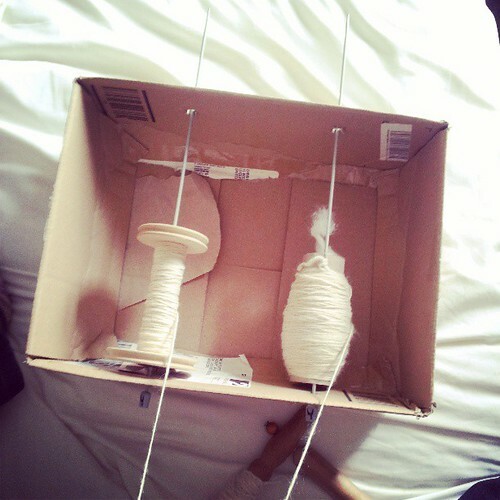 I splurged and bought a niddy-noddy that creates a 1.5m skein diameter. I enjoyed taking my washed fibre and re-skeining it so that I could work out how much I had. I knew that this would be a worthwhile purchase because I now seriously have the spinning bug, and it could also be used for re-claiming yarn, of which I seem to do a lot of. I have approximately 180m of really random yarn. It's very overspun in some areas and very loosely spun in others. The thickness of each ply varies tremendously from pretty thick to teeny and tiny skinny strands. I imagine it would be hard to create this yarn on purpose! 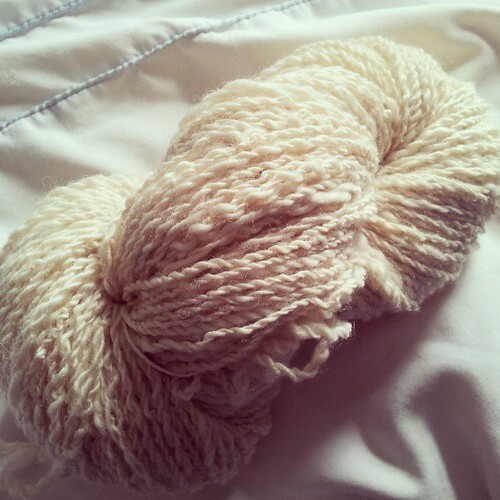 I really loved spinning with the BFL, it's incredibly lustrous and smooth and the fibres aren't too short for a beginner like me. 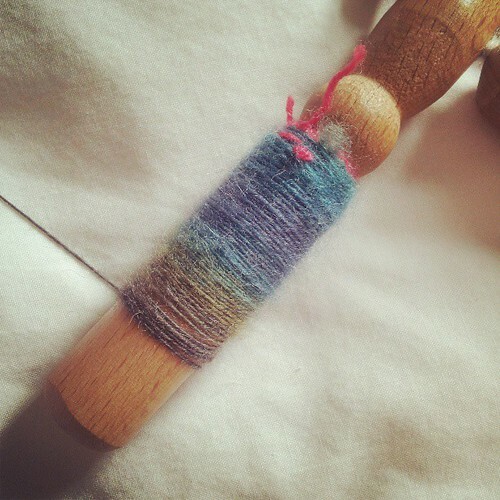 Obviously after getting this bug, I have purchased some very pretty fibres to spin next. I got them from Picperfic. 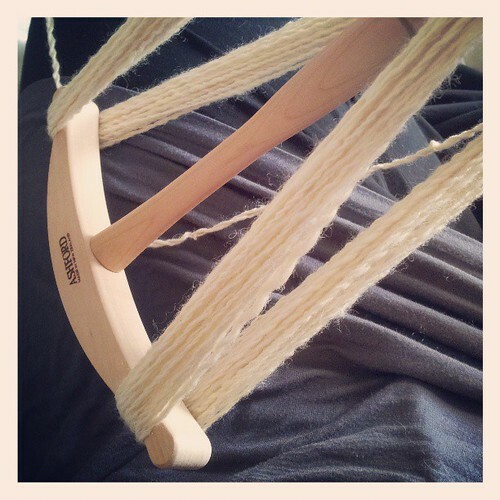 I bought a straight forward BFL braid, as I enjoyed spinning the undyed version of this fibre. I love this colourway. It's so pretty. 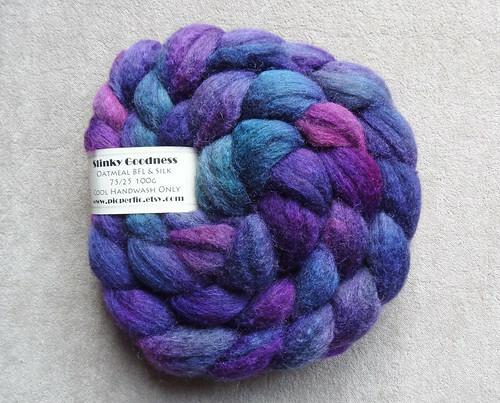 I also bought a BFL/Silk mix braid because the colour made my mouth water. I'm itching to give the blend a go, but I decided to be sensible and start with BFL first and see if I can build on what I started with the first skein. I think I am becoming more consistent. Here is a picture of what I started with. I split the braid into three sections and weighed them on my handy dandy new knitting scale, American Weigh Black Blade Digital Pocket Scale, 1000 by 0.1 G , to make sure they were pretty evenly matched. I've put much less twist in the fibre this time and it's going much more quickly and the ply seems to be much more even. The colours are making my mouth water. I decided to divide it into three, because I want three plies to create a thicker yarn. The spinning is really helping me with pain control. Using this handspinner is great because I can use it lying on my bed and the action is very hypnotic and soothing, so it takes my mind away from feeling rubbish. It's not as quick as a drop spindle, because you have to stop and start, but I couldn't use a drop spindle in the prone position anyway! I have been lusting after an Ashford E-Spinner though. I think I could rig that up to use in bed! Trouble is, that it is very expensive, much more than a regular spinning wheel. It's something I would have to save for and maybe put birthday and Christmas money towards, perhaps next year. I think that would give me a good chance to work out whether this is something that is worth investing vast quantities of cash into or not. Maybe I'll just be happy to continue handspinning now and again! Something tells me that spinning is going to be an ongoing hobby, it's one reason I didn't want to try using a spinning wheel. I knew I would love it and it would be a hobby that would hurt my body, so I didn't even want to try it. Once I heard about the E-Spinner though, my mind starting racing in anticipation. Maybe I'll become a spinner yet! Oh by the way, it had recently been pointed out to me that the commenting system I use, Disqus, didn't work with tablets. I did some research and found out that some extra html code was required to make the widget work with the Blogger mobile website. I have fixed this code now, so if you weren't able to comment using the mobile site, the version mostly used by mobile phones and tablets, you should now be able to do so. I'm sorry it took so long to sort out, I hope you will try commenting again.